Between the years 1951 and 1977, a class called “History of Paleontology” was offered through the Department of Paleontology. Charles Camp taught it for the first nine years and Joseph Gregory was the instructor for the remaining years that it was offered. One of the requirements of the course was a term paper on some prominent figure or locality in paleontology. This is one of those papers. Only minor edits have been made. This biography of Dr. Robert M. Kleinpell is concerned primarily with his scientific contributions to the field of paleontology, as well as the people, events, and concepts which influenced them. A complete account of Dr. Kleinpell’s many experiences and contributions is beyond the scope of this paper. The bulk of the information compiled here was obtained through personal communication with Dr. Kleinpell. I would like to express my sincere gratitude for his cooperation, time, and advice. Robert Kleinpell was born in Chicago, Illinois, on September 13, 1905, a fourth-generation American with Frisian [a Germanic people from the coastal regions of the Netherlands and Germany], Danish, Kur [peoples of the Zagros Mountain region of Iran and Iraq], Dutch, and French roots. The majority of his forebears had resided in Wisconsin, engaging in such occupations as farming, shipping, and the professions. Kleinpell’s father was an architect who worked under Louis H. Sullivan — in the year 1913 he moved his family west for professional reasons. Settling in California, he worked in conjunction with Allison & Allison and with Dodd Richards. the role of science applied as an art in human affairs as well as its application to the purely philosophical. In addition to this, archaeology has provided Kleinpell with a worthwhile and interesting hobby to which he applies as much time as he can allot from his too-busy schedule. In 1927 he was awarded a fellowship at Stanford. His work here was done in the field of stratigraphic paleontology under the guidance of J.P. Smith and H.G. Schenck. Smith and his student Ralph Arnold had already played cardinal roles in the blocking out of the Cenozoic history of the west coast ranges on the basis of the megafossils. Kleinpell’s thesis work was the correlation of Cenozoic strata from the Salinas Valley to the San Joaquin Valley. The use of foraminifera as a possible means for refining correlation had come into the “stratigraphic limelight.” He used this comparatively new tool to determine the age relationships between the Vaqueros and the Temblor Formations. Previous attempts to solve this problem by employing molluscan data had failed, due to complications introduced by numerous facies changes which affected the local composition of these faunas from place to place. After completion of his Master’s work at Stanford, he went to work as a field geologist for the Richfield Oil Company, a position he held from 1928 to 1931. He worked along the west coast from Sonora and Baja, California, to British Columbia. While at Richfield, he became acquainted with many correlation problems presented by such formations as the Monterey shales and further realized the importance of correlation by foraminifera. It was also at this time that he recognized the inseparability of field work and laboratory work. No problem of any extent could be solved by either branch working independent of the other. Certain relations could be traced in the field that could not possibly be determined in the laboratory. Conversely, laboratory work revealed information that was beyond the scope of a geologist in the field. Only by a merging of these two means could any profitable end be reached. The depression of the thirties presented two alternatives to Kleinpell: he could either go to work as a cost accountant for Richfield Oil, or he could return to school for his doctorate. He chose to return to school for several reasons: (1) he was interested in the Monterey problem as expressed by R.D. Reed and D.D. Hughes of the Texas Oil Company; (2) he was further encouraged along this line by W.P. Woodring and M.N. Bramlette who at that time worked with the United States Geological Survey and were about to launch a petrographic study of the sediments of the Monterey Formation; and (3) Stanford University offered him assistance in the form of a fellowship. So Kleinpell reentered Stanford in 1931. His doctoral work was an expansion of that which he had completed for his Master’s degree. He continued correlation up through the Monterey shales and, with the late George L. Richards, Jr., the Santa Margarita sandstone which was demonstrated to be equivalent to the upper Monterey. Molluscan species are, as a rule, of small value as zone fossils; but associations of species may be of value. A long lived species has as contemporaries in its youth other species that preceded it in extinction, and new species arose to be its contemporaries in old age. Consequently, if the exact time range of a great number of species were tabulated, it might be found that even small divisions in time were characterized by a particular association or overlap of species, some of which lived no later, others no earlier. Even then, it is not to be supposed that such an overlap was contemporaneous over very wide areas; and, in any case, the method involves working in a circle: you must fix the range of each fauna before you can determine the range of each species and vice versa. It is a slow process of trial and error and repeated readjustment. No attempts had been made in this country to employ Oppel’s methods of correlation until the early thirties when Ralph Reed, chief geologist for the Texas Oil Company, suggested them as one of several possible solutions for the correlation problems of the Monterey Formation. Dr. Kleinpell, along with his classmate, Simon Muller, and their professor, H.G. Schenck, can be considered pioneers in the development of the “Oppel zone” as a means of correlation in this country. Kleinpell was officially awarded his Ph.D. in geology in 1934, although he had already completed his work a year earlier. One summer while working on his doctorate, Kleinpell had the opportunity to attend the Hopkins Marine Station where he studied under T. Skogsberg and W.K. Fisher. Here he met his wife-to-be, Dariel Shively, who was a zoologist working at the station at that time. They were married in 1934. Mrs. Kleinpell has accompanied her husband on many of his travels to the Pacific and has served as a constant source of inspiration in his scientific endeavors. From the years 1933 to 1939 Kleinpell formed a loosely associated geological consulting group with L.W. Sanders, a geologist later to become the “Intex Oil Company,” Warren Ten Eyck, and his brother W.D. Kleinpell. This group succeeded in working out various phases of discovery in the Edison oilfield for the A.T. Jergins Trust (now the Monterey Oil Company). The paleontological portion of this work appeared eventually in a paper by A. Diepenbrock for the California Division of Mines. From 1933[?] 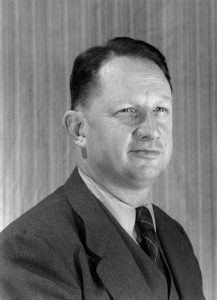 until 1939 he was also in charge of the Richfield laboratories in Bakersfield, California, and was a consulting paleontologist for the General Petroleum Corporation. During the first four of these six years he was also associated with the United States Geological Survey as an assistant geologist. However, he did not do much work for this organization after the year 1933 [sic]. Other scientific by-products of his professional work in the San Joaquin Valley and the L.A. Basin between 1933 and 1939 are to be found in a United States Geological Survey professional paper on the Kettleman Hills by W.P. Woodring, R.S. Stewart, and R.W. Richards, and in a joint paper with Woodring and Bramlette on the Miocene of the Palos Verdes Hills. Comparable work for the North American Consolidated and other companies on the coast led to comparable publications. In 1936 Kleinpell and H.G. Schenck collaborated in producing a paper on their work in the Oligocene (Refugian Stage) of the Santa Barbara coast. A final synthesis of Dr. Kleinpell’s Ph.D. work with much detail was published in book form in 1938 and was entitled The Miocene Stratigraphy of California. Arnold, Z.M., and R.M. Kleinpell. 1951. Cretaceous in the Philippines. Geological Society of America Bulletin 62, part 2 (12):1455. Corby, G.W. 1951. The historical geology section, pp. 229-297, in Geology and Oil Possibilities of the Philippines. Republic of the Philippines Department of Agriculture and Natural Resources Technical Bulletin 21. Manila, Philippines. Cloud, P.E., Jr. 1956. Provisional correlations of Cenozoic sequences in the western and central Pacific. Proceedings of the Eighth Pacific Science Congress, Manila, 1953, vol. 2. Pp. 562-563 covered Philippine correlations. Kleinpell, R.M. 1958. Notes on Cenozoic correlation and geologic history in the Philippines. The Philippine Geologist 12(1):1-15. The late summer of 1941 found him back in Manila with the task of helping the navy find a petroleum reserve in this area. He was captured here in 1942 by the Japanese and spent a year and a half in the internment camp at Santo Tomas. This was followed by a stay of equal duration in the camp at Los Banos. Because of the great number of school-age children in these camps, an educational program was organized and Kleinpell taught systematic biology and historical geology. It was a gratifying experience for Kleinpell to find that students whom he taught at that time were given credit for this education by schools and colleges which they attended after their rescue in 1945. Dr. R.F. Barton, the late professor of anthropology from the University of California, was a fellow prisoner of Kleinpell’s in the Philippines. These two men later combined their efforts toward producing a book, Historical Biology in Human Affairs. This project was slowed down in 1947 with the death of Dr. Barton, and it was halted indefinitely in the summer of 1952 when the publishing house of William Sloane and Associates, who had requested the work, failed, and the science series of which it formed a part was discontinued by the creditors and successors, E.W. Morrow and Company. Correlation in the lower Tertiary of the ranges of the West Coast by the use of foraminifera had meanwhile become of increased importance to the petroleum industry after the war. Through the offices of Charles Camp and Ruben Stirton at the University of California, Kleinpell was given the opportunity to continue his zonation work in the Coast Range. This is his principal, although by no means individual, task today. Among other duties, Kleinpell instructs classes in correlation and foraminiferal studies at the University of California. He still is a consultant paleontologist for various oil companies in the United States and for the Ansor Corporation in the Philippines (Philippine Oil Development Company). Wilson, E.J. 1954. Foraminifera from the Gaviota Formation east of Gaviota Creek, California. University of California Publications in the Geological Sciences 30(2):103-170. Smith, H.P. 1956. Foraminifera from the Wagonwheel Formation, Devils Den district, California. University of California Publications in the Geological Sciences 32(2):65-126. Smith, B.Y. 1957. Lower Tertiary foraminifera from Contra Costa County, California. University of California Publications in the Geological Sciences 32(3):127-242. Kleinpell’s second project is a joint work with Simon Muller dealing with the principles of biostratigraphy and stratigraphic paleontology. Muller will write in connection with Mesozoic formations, while Kleinpell will restrict himself mainly to strata of Cenozoic age. This work is to be a synthesis of the phylogeny, bionomics, and historical geology in the areas of their attention. It will also involve the demonstrable principles employed and the conclusions which they have revealed. Throughout his life, Dr. Kleinpell has tried to approach his work from both the practical and the philosophical standpoint. A theory for theory’s sake alone has held little interest for him. Only demonstrable principles, that is to say, theories that have come under adequate factual discipline so as demonstrably to be generally true, are worth extensive consideration. Such a principle he has found in Oppel’s method of zonation. When this method has yielded incorrect results in the field, the cause of the discrepancy could invariably be traced to misapplications rather than to the basic priniciples themselves. Kleinpell concludes that Oppel’s principles of zonation, much refined and severely tested, are as sound today as they were at the time of their formulation and first demonstration one hundred years ago. Read a short description of Kleinpell’s career written by Zach M. Arnold, W.B.N. Berry, and D. Weaver after his death in 1986. Berry, W.B.N. 2008. Robert M. Kleinpell: Founder of the Berkeley school of stratigraphic paleontology. Earth Sciences History 27(1):100–112.